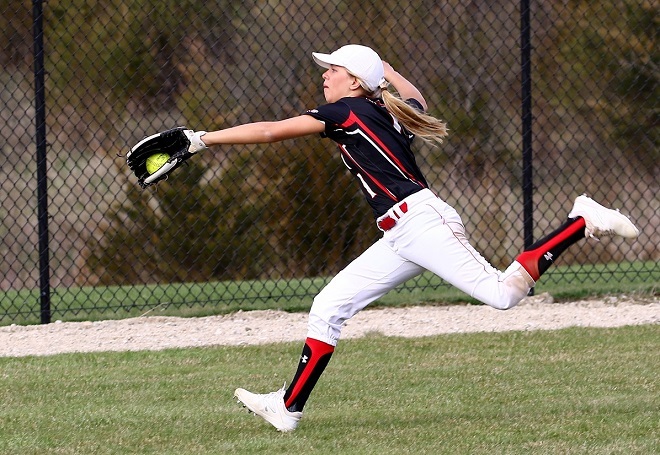 Wilmot outfielder Haley Lamberson makes a running catch during a game at Westosha Central last year. The center fielder will be one of three team captains this year (File Photo/Report). For the Wilmot Union High School softball team, its season hinges on two key components, pitching and leadership. Wilmot, which finished second in Southern Lakes Conference play at 11-3 (17-4 overall), welcomes back senior left-hander Madi Zerr and sophomore right-hander Anna Wischnowski as the team’s dynamic duo in the pitcher’s circle. Zerr, as a junior, had a 2.24 ERA through 84 1/3 innings, where she struck out 94, walked 31 and finished 9-3 en route to first team all-conference honors. She also boasted a .500 batting average with 15 RBIs, 24 runs scored along with nine doubles and a home run. Wischnowski (8-1), meanwhile, logged three shutout wins, fanned 39 and walked eight in 61 2/3 innings to complete her freshman campaign with a 1.93 ERA. At the plate, she drove in 16 runs while scoring 10 herself, collected two doubles and a triple, and batted .585 with a .635 on base percentage. Wischnowski, a second team all-conference, played third base when Zerr was in the pitcher’s circle last year. Zerr joins senior outfielder Haley Lamberson, who was first team all-conference a year ago, and utility player Sami Christiansen as the team’s captains in 2019. Lamberson, who committed to Division II University of Missouri-St. Louis, set the table as the team’s leadoff hitter last season. In 21 games, Lamberson batted .377 with 13 RBIs, 20 runs scored, four doubles and a triple along with six stolen bases. She also had a 1.000 fielding percentage. Wilmot also brings back senior outfielder Ambriel Siggeman. Junior Kenzi Ketterhagen, who primarily played outfield in 2018, will likely get an opportunity behind the plate to start the season. Ketterhagen served as backup to graduated senior Annalise Devall. As for graduated seniors, the Panthers will also need to replace second team all-conference Montana Platts, a shortstop who plays at Madison College. Hayli Richards, another departing senior, played the corner infield spots before heading to University of Missouri St. Louis. Jacobson admits replacing the three seniors will be difficult. “Whenever you lose any seniors, there are always holes to fill,” said Jacobson. Jacobson, however, will look to a handful of newcomers, including senior outfielder Riley Alexander and freshman infielder Alana Buchanan. Alexander, a varsity basketball player, has been a positive addition to the squad. Buchanan, according to Jacobson, could play one of the middle infield spots. Sophomores Josephine Beinecke (infield/outfield) and Hailie Morton (utility) will also contribute to the team after they were called up from junior varsity at the end of last year. Other newcomers are sophomore Kimmy Zender (infield/outfield) and junior Shelly Edmonds (utility). In the SLC, where the Panthers split their season series with WIAA Division 1 state runner-up Burlington and third place Westosha Central last season, Jacobson believes any team is capable of winning the championship. “I think any of us can make it happen. It could be any of us,” she said.